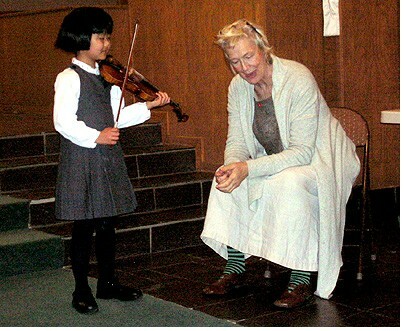 January 14, 2007, 1:00 AM · I just never can get enough of watching Suzuki pedagogue Helen Brunner teach. Brunner, of London, came to Pasadena to give master classes and a teacher workshop for our Suzuki Group here, Suzuki Talent Education of Pasadena (STEP). Helen is the master of crystallizing the elusive teaching point: why someone's energetic performance isn't energizing the audience; how someone can be playing in tune, but not compellingly in tune. She also manages to turn it into a positive experience that has even the most nervous student smiling widely by the end of their chat. For a girl who got derailed playing the Bach a minor concerto, she said, "One of the most difficult things about this piece is the memory. I call this an NTS piece: "Nearly The Same." Because so many passages come many times in different guises, "you have to put the memory of this piece not just through the EAR system, but also the BRAIN system." She also advised her to play assertively, to be the soloist and lead the pianist. Helen demonstrated non-assertive playing, with soggy, slow notes. Then she walked over to the piano and leaned against it, dramatically. "No floating on the energy of the pianist!" After teaching probably thousands of children, she also can thin slice issues swiftly. From one student's quick ear when tuning, Helen forecast that the student's performance of a movement from Haydn Concerto 2 would have the same qualities. Indeed, it was very much on top of the beat and lucid, with a stellar cadenza. In the end, Helen said, "I wondered if you would do the cadenza, but you gave me the feeling you would. It's important to give your audience that kind of feeling." For another girl, she pegged the student's left thumb clench as a remnant of childhood playing: trying to keep the violin from falling by holding it with the hand. For her she recommended a 50/50 deal between the head and the hand for holding the violin up. The mild torture in the left hand was causing intonation problems. Instead of faulting her for any intonation problems, Helen noted "This girl has brilliant intonation in her head; she just needs to get her left hand working for her." One of our tiniest students played La Folia for Helen, who managed to translate the concept of expressive intonation into the language of a six-year-old. She noted that the notes D and E were magical, that they rang in a special way. One must not cover the open strings with fingers; one must let them ring. "If I squash my finger over it, I can't hear the open string!" The little girl nodded in agreement. From the way she played, she very clearly understood. She took it even further; Helen went on to explain that C# was an expressive note – "I love to hear it really high." Producing the note involves putting the second finger very very close to the third. So very tall Helen demonstrated by standing next to the very small girl, very close, "excuse me, I'm a very expressive note," and she leaned a bit her way. The girl smiled big. She got it! Another boy played with a great deal of movement. Instead of reprimanding him for moving too much, Helen congratulated him for his great energy, and his generous spirit for sharing it with the audience. Then she told him something Shinichi Suzuki had said to her: "He liked the way I moved my feet, but he wished I wouldn't move my shoes..." She advised him to keep his energy inside, in the stomach, right beneath the belly button. "It's a question of directing energy," she said, "Keep all the movement you have, but control it." While practicing double stops with a boy who was playing the Sarabande by Bohm, she observed that "technique has nothing to do with being musical. Technique has nothing to do with being intelligent." Instead, it is well-developed physical movement. She was helping him find the proper "platform" or plain where the bow touches two strings, as it is different than the platform for either string alone. At another point during the master class, she had two students dancing a gigue while another student played the Gigue from the Bach d minor Partita. She advised another girl not to look sideways at her violin when she performs, but to look at it straight on in order to give it full focus and energy. "Would you marry the man who looks at you sideways when he says he loves you?" she asked everyone. Then she walked around, looking at various people sideways, "I love you!" she said,her pupils in the extreme corners of her eyes. "You just don't trust it, do you?" But we all know: when she has something to say, Helen looks us straight in the eyes! January 15, 2007 at 05:03 AM · What a joy! Thank you. This one I am saving. January 15, 2007 at 08:52 AM · Me too! Thanks Laurie, once again. January 15, 2007 at 11:33 AM · "Helen is the master of crystallizing the elusive teaching point: why someone's energetic performance isn't energizing the audience." I think this is what it's all about. I wish you'd get her on here to write a piece about that. I want to know everything she knows. Make her spill it all right here. January 15, 2007 at 11:32 PM · I'll be happy to spill all I know about what she knows, Jim...gimme about a day! And of COURSE I'd welcome her comments, but she's currently trotting around the globe, teaching constantly! January 16, 2007 at 08:39 PM · This is so wonderful! Thanks for sharing. January 17, 2007 at 01:22 AM · I look forward to it when you get around to it. And that ^(your article), is why I like Suzuki.